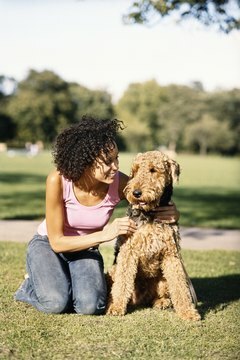 The Airedale is known as the "all-in-one" dog - hunter, herder, guardian and devoted family member. Airedale terrier lovers appreciate these dogs for their intelligence, energy and trainability. Airedales are versatile pups that respond well to obedience, socialization, agility and hunting training. They demand a trainer who can devote lots of time and will work to keep these "smart cookies" in the moment. Airedales are intelligent dogs that learn quickly. It's important to start obedience training with your Airedale right away because they can be willful dogs who hold their ground if challenged. Airedales are different from other dogs because they see themselves as working "with" their trainers rather than "for" them. The "king of terriers" is disciplined and able to think for herself in order to carry out complex commands. Airedale puppies do well with short training sessions without much repetition. This is a breed that gets bored easily, so professional dog trainer Ty Brown suggests not asking your Airedale puppy to perform the same task several times in a row. Puppy classes are also recommended because they keep the activity varied and engaging for your baby Airedale. Airedales are rarely the first dog to back down in a confrontation. Because they prefer dominating rather than submitting to other dogs, it's important to socialize your Airedale in puppyhood and continue her regular interactions with other dogs throughout her life. Any dominant behaviors should be discouraged, such as barking at other dogs (often a sign of aggression), mounting or pinning. This breed should not be taken lightly when it comes to exercise. Giant terriers require more activity than most dogs and will make their needs known. Because they're so energetic and also easily trained, Airedales are ideal candidates for agility training. If you can devote time to taking your Airedale to agility class or setting up a training gym at home, you're on your way to a happy relationship with your pup. Again, when agility training your terrier, keep the activities varied and don't repeat the same activity too many times, or your fuzzy friend will lose interest. Professional dog trainer Ty Brown recommends that puppies start their exercise training small and work their way up to longer bouts of activity as they get older. Hunting is natural for terriers of all sizes and the Airedale is no different. Historically, Airedales hunted badgers, water rats and many other small animals. The Airedale Terrier Club of America claims this breed was the first "remote control" hunting dog, meaning they could be sent into the brush to stalk, kill and retrieve small game. If you're a hunter you can easily train an Airedale puppy to be your stealthy, effective hunting companion in the bush. Airedales don't mind the cold and love the water, so they can even be used to bring down waterfowl. If you don't want your Airedale to harass the woodland creatures around your home -- or even your other pets -- it will take significant training to mute this trait to a manageable level. Practicing your obedience commands with your Airedale when she's tempted to hunt will help keep her game-seeking instinct in check. Airedale Terrier Club of America: Who's Training Who At Your House? How to Determine Which Cat Food Is Best? Has Anyone Invented a Toilet for a Dog?